Aaaahhhh! I did it again. I do it all the time. I see things on Facebook that I want to look at but I don’t have time or when I see it is it not the right time to look at it so I open it in another window. Then I can watch it, read it, do it (whatever) days later. But then I forget who posted it. This is a Nia video so I know that one of my Nia friends posted it. It took me days to get around to watching it. Then once I did watch it I was soooo disappointed. It is a video of Carlos Rosas (NKA Carlos Aya-Rosas) at a conference talking about the 5 Sensations of Nia. As he is talking I start looking at the time left and I keep thinking, he’s not going to make it. I kept HOPING he would, but I kept thinking, he is not going to make it. He didn’t. He was halfway through (or so it seemed) his talk about Mobility when the video stopped. Sad face. That is why I was disappointed. I was sad because we don’t get to hear all five sensations. But . . . watching the ones he did get through are well worth it. It is just a bummer that we didn’t get information on all five. I am not sure what year it is, but you will see that they are being referred to as Debbie and Carlos Rosas. Which I always thought that eventually they were referred to as Debbie Rosas and Carlos Rosas. But that is not the point of this post or the video I was just trying to see if I could have an idea of what year it was, but again . . . not that important because the information is tremendous. The information is very helpful no matter when it was recorded. Carlos first walks you through some things you can sense. He connects them to the 5 Sensations. If you’ve read a few of my posts about Nia you might be familiar with my belief that Nia takes everyday things you are familiar with and probably aware of and connects it to Nia ideas. If you watch this you can get an example of them doing that in the time from 2:45 to 7:00. After the initial connection to the five sensations, the first sensation Carlos defines is Flexibility. He describes it as energy moving out. So not just stretching, but energy moving out. Then he talks about Agility. He describes that as a quick start stop. He uses the adjective “explode”. This is a very entertaining part of the video. Carlos is a very funny speaker. Then he gets a few minutes into a mobility. He describes that as continuous movement. He talks you through a bit of it, then the video stops. Even though we only get to see two sensations and a portion of mobility it is still great information. I am not giving you too many details because I want you to watch it. It is so much better from the creator than from me just typing what he is saying. This was posted by Nia, in addition to watching this video you can go to the Nia Channel on Youtube (click here) and see other videos they have posted. Also, you can go to NiaNow.com and watch recordings of classes. From the home page scroll through the pages and you will find videos of Nia classes. You can dance right along with Debbie and other trainers! I invite you to watch the video and participate with his exercises to connect you with the sensation of Flexibility, Agility, Mobility, Stability, and Strength (this is the first portion I mentioned). Then stick with it for even more connection to Flexibility and Agility. When thinking of agility I tend to think of my entire body starting then stopping. My entire body moving one direction then changing quickly, like the definition states. But agility can be just in the fingers, in the hands, in the arms, or just in the legs. Our entire body does not have to move for it to be an agility movement—or at least that is how we call it in Nia. We do a lot of movements that require agility. I just posted about Creeper Crawlers. That is an agility movement of the fingers. They are starting and stopping and going one direction then the other. Drumming is a great example of agility. Your arms and/or hands are starting and stopping and changing direction. We drum in Nia. There are certain routines where it is part of the choreography. There are times when we do it in FreeDance. The music often calls for drumming. Sometimes we listen. Drumming is a fun way to connect to the sensation of agility. Without actual drums we can drum all around our space; up in the air above our heads . . . in one of our Nia routines they call this sky drumming. We can drum below our bodies, to the sides, behind our bodies, around in a circle, all over. Sometimes I invite the class to imagine they are in the middle of a HUGE drum set with drums all around them. They can’t even move without hitting a drum. That is some wild drumming. Looking around and allowing the head to change direction is a form of agility. Look! Look! Look! As if you are watching a bug fly around. Hip bumps . . . keeping those hips juicy with that left right action. If you are really playful, hip bumps back and forth . . . it’s all about being agile. Another great show of an agility move is kicking. Kicking like a swimmer’s kick. Fast feet, fast action action. One direction then the other. Back and forth. Of course this can be done with the action from the knee or even the hip. Whatever joint does the action, kicking is another great example of a movement that requires agility. A number of Nia’s 52 Moves of the The Upper Extremities can be tied to agility. Blocks and punches can be done with a quick change of direction, along with webbed spaces and palm directions. Agility is one of Nia’s Five Sensations that we practice and play with in our Nia classes. The other sensations are Flexibility, Mobility, Strength, and Stability. Like many groups and professions we have many acronyms, the one for Nia’s Five Sensations is FAMSS. The A is for Agility. What do you do that can be considered an agility move? I believe that many people think yoga has been “Westernized”. Since there are so many types of yoga there might not always be a spirituality in the yoga class or chanting, meditating, or even the Sanskrit terminology. That is true with a PiYo class. It is more about the physical with an awareness. PiYo combines yoga breathing and Pilates breathing. In general a yoga pose is done with yoga breathing and a Pilates exercise is done with Pilates breathing. Of course, students are encouraged to breath in a way that is comfortable to them and that works with their individual body, the aforementioned is just a general guide. 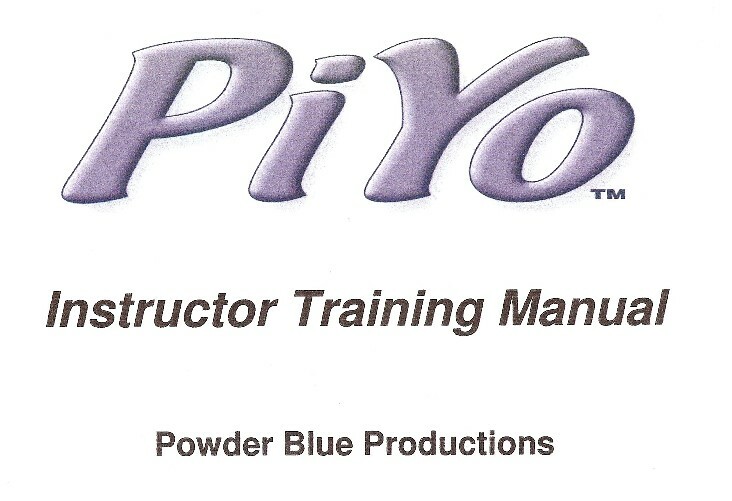 The PiYo class follows the tried and true module of a typical exercise class. There is a section for warming up, a section for general strength and balance, a section with more of a focus specific area of the body (say a core, upper body, or lower body), then a cool down and relaxation section. While yoga poses could meet all the requirement of each section and Pilates exercises could also, it is often the case that each section will have a majority of one or the other. Although, you might be like me and think that there is such a huge cross over it is difficult with some moves to claim it is only a yoga move or only a Pilates move. While I am certain the move did originate from one or the other practice specifically it seems as though currently there is a huge cross over. That is one reason why I think Pilates and yoga marry ups so well. They can be considered very similar. So throughout the class there will be yoga poses and Pilates exercises. It is up to the instructor and the make-up of the class as to whether the yoga poses will be held for a measured amount of time or done in a flow. No matter which is chosen it will be a sequences of poses. Whereas the Pilates exercises are done in repetition. Generally sequences of repetitions. A PiYo class is allowed the freedom of design. As mentioned there is a class format, but then the way it is carried out is dependent on the instructor and students. The consistence of a PiYo class is that it is for the body and the mind using both yoga poses and Pilates moves. Do you practice yoga? Do you practice Pilates? My husband and I used to dance. We danced “Country Western”, we did the two step, the cha-cha, the waltz, and the west coast swing. We liked to dance. I sometimes would fake it though. Yeah, I would. We would go to a lesson and they would show us a move. We would practice it during the lesson then usually there was a dance party after. We would join the party. My husband would always DO THE MOVE WE JUST LEARNED. I would say, “Ack! You’re doing the move we just learned!” And he would look at me with a look that said to me, “Of course, Silly Woman, that is why we are here. To learn stuff and then actually DO IT.” But for me the time spent in the lesson was never enough to actually learn it. Even though the leader’s part is much more difficult than the follower’s, I still couldn’t get it in one lesson. So a lot of the times I would fake it. And by fake it I mean, that if you were to look at my feet and KNOW where there were supposed to be, you would know my feet were not correct. I could move in a way that if you were just casually looking you would think I was doing it right. I would always make sure I was facing the right direction so you wouldn’t really know my feet were not doing the move correctly unless you knew the move yourself! Since most people don’t stare at your feet the entire time I often got away with it. I was good at faking it. Faking it was easy in the fast songs. Eventually I would learn the move correctly, but there were some moves that took me a long time to get. Then somewhere along the way we decided to compete. I mean, competing really is the only way to know if you are really improving and to spend all that money on lessons and not improve can be a silly thing. So we decided to compete. Do you know what that meant? No more faking it. I mean the whole point of competition is to have someone look at you and judge — among other things — your feet. So I had to stop faking it. I am learning a lot as I sub for different exercise classes. I recently subbed a class and I was reminded of the faking it. It is easy to fake it in some classes. Let’s say Zumba for example, I’ve posted before about how Zumba is all agility (I have since learned otherwise, but I will reflect on that in a post at a later time). Zumba is the fast start and stop. Move stop the move and move the other direction, move stop, move stop. The full range of motion is usually not achieved, you are moving to another move before you really get to finish the first one. Start, stop, start, stop, start stop. It is easy to fake. The fast dances were always easy for me to fake. The good thing about faking it is you are still moving and that is good in a sense. Even if you are not doing the move correctly you are moving and burning calories and often it is so fast the casually observer or someone standing next to you is not going to notice. I think this is one of the things that people like about Zumba . . . you are moving and dancing even when you are faking it. It is the slow dances that are difficult. With Nia it is not as easy to fake. With Zumba a move could be hopping from one leg to the other. With Nia we might actually balance on one leg. No speed to it, just lifting one leg off the ground and standing on one leg. Strength and stability. No faking. I always invite participants to use a chair, a wall, the barre, or even their other foot, but either way you cannot FAKE standing on one leg. Sadly, I think for some, not being able to fake it keeps them from joining in the joy of Nia. The judgment from themselves is so great that they can’t let go and just do what they can because what they can do is not blurred by the start and the stop. What they can’t do is not blurred by speed. And they don’t give themselves the chance to learn how to do the moves. They don’t allow themselves the time to get the muscles in a condition where they can move slow and controlled. Faking it is easy, it is actually doing a move slow, controlled, and correctly where the difficulty comes in. When I take a Zumba class I know I fake it often because I don’t know the move so I concentrate on being at the right place and/or facing the right direction at the right time. Eventually I get the moves . . . well, most of the time. I know this is my opinion, I don’t really KNOW, but it is coming from a place of judgment based on some things I have seen and heard. You know I am always trying to figure out the differences between Zumba and Nia and why people like them. And recently this was a thought because of something I heard and observed . . . the speed, the faking, the judgment. Do you fake until you make it in your exercise class? I teach Nia. I have been teaching Nia for three and a half years. Not as many people who I talk to have heard of Nia as have heard of Zumba so I am constantly being asked the difference between Nia and Zumba. Since I am often asked I am often thinking about them and comparing them. First, they are actually the same in that music is played and participants dance to it. Second, in both the instructor leads the participants through the various dance moves. Third, participants of both claim they are both fun. One difference is Nia is an experience in five sensations, Zumba seems to concentrate on one. 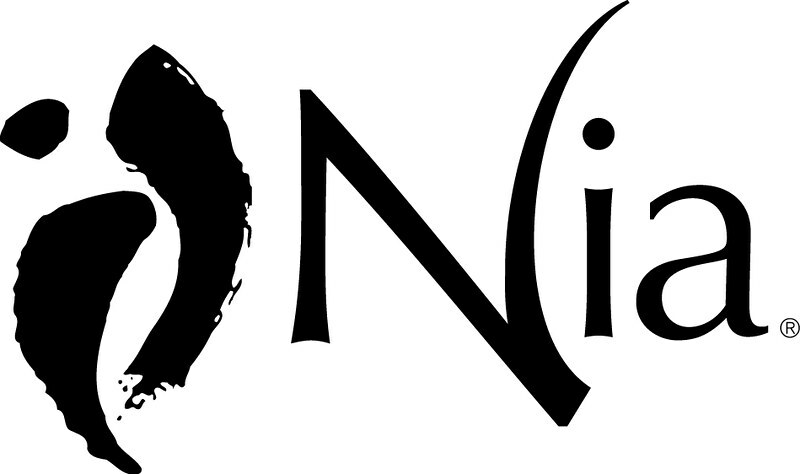 The experience is such a big part of Nia we actually call them the five sensations of Nia. I have posted about them before (FAMSS). They are the sensation of flexibility, of agility, of mobility, of strength, and of stability. In a Nia class your body will move in a way that allows you to sense the energy moving out and away. You will bend and stretch to play with flexibility, either retaining what you have or improving upon it. There are moves in the routines that require the start and the stop. The movement that is agility could be done with our feet, our arms, our hands, our bodies, our heads or a combination of body parts but we sense the start and the stop. With every routine there is a lot of mobility, some routines have more than others, but all of them that I have experienced have a lot. With mobility it is just the same as agility in that it could be a body part that is moving or our whole body. Whatever the case there is a lot of movement from each joint that helps create a healthy joint by allowing the fluid to move to it and within it. Then we also play with strength. We might squeeze our muscles sensing the energy moving in as if the bones are being hugged by the muscles. We might do squats or sit-ups, punches and/or kicks, but there is time where we play with strength. I say Nia is very big on balance because we do many moves that requires us to be stable. Many of our moves are balancing on one leg, could be a kick, could be a stance, but it requires stability. Moving from one move to the next often requires us to call upon our stability. In a Nia routine we experience all of these sensations. I’ve reached the conclusion that Zumba is primarily agility. In Zumba the moves are always fast. So it is a constant state of start and stop. The only sensation I sense while doing Zumba is agility. Fast start, fast stop . . . . even when there is a stretch where your muscles are yearning for a second to move to their fullest length, it is a fast stretch that does not allow for the muscle to be fully stretched. Doing a full hour of agility is not a bad thing at all. It can be fun and it can produce a lot of sweat. And many of us are programmed to think that sweat equals a good workout. I think that if you are adding Zumba to a stretching program that has some balance practice in it that is great. I am also a believer that there are a lot of things that compliment Nia too. I actually think that if you like Nia and Zumba and you are able to do both that is a nice combination. You get two different types of cardio. One that is a workout in the sensation of agility and one that can move you through more use of the entire body to get that heart pumping. I really believe that whatever gets you moving is GREAT. I think that you have to like what you do in order to make it a constant in your life. So Zumba, Nia, Jazzercise, U-Jam, yoga, kickboxing, bootcamp, weight training, whatever works for you is great. Do what you will do! That is the key! It is that I am always asked about the difference between Zumba and Nia that I am always thinking about it and this was my latest thought after I did a Zumba class. I think I posted before about how I am left wanting to extend and finish my moves in Zumba and it dawned on me that it is the sensation of agility that is predominant in Zumba. Some Zumba classes I have attended do take a song to stretch at the end, but not all of them. So I guess it depends on the instructor. Nia instructors are encouraged to infuse their classes and the routines with their personalities, so I am sure that every Nia class has a few differences too. Both Nia and Zumba are great cardio workouts. It just depends on what you want to do during your workout and what you want to get out of it. Do what you will do! I love Nia because I think of it as a way I can help people change their lives. I believe movement is the key to maintaining flexibility, agility, mobility, strength, and stability in the body. I believe that FAMSS are necessary components to leading a high quality life. I also believe there are other way people can inspire others. One day in the mail I received a card. Here are pictures of it. It is obviously a handmade card. The flowers sparkle, not just the “gems” in the middle but the flowers are sparkly. I love this card. I had it in my kitchen in the middle of my peninsula so that I could see both the front AND the back. It ALWAYS — no matter what — makes me smile. This was sent to me from a fake friend. I say “fake” just so people who qualify their friends with labels such as “real” and “in real life”/IRL can understand that I have never met this woman face to face. I have only become friends with her through online portals or social networks. First I believe it was a friend’s blog. Then my blog and her blog or her blog and my blog, then Twitter. Or maybe it was Twitter then the blogs. Then Facebook. Yeah, I am sure Facebook was last. There was even some e-mail. And let’s not forget . . . . US Mail . . . . snail mail. My card. My card that was made for me and sent to me by someone I have never met f2f (face to face), although the card proves that she is real. Very real. Also, the card is real life. I live my life and I look at that card. I actually have it in my office now which is much better because I see it for longer periods of time. It is in my line of sight. I have it to make me smile. 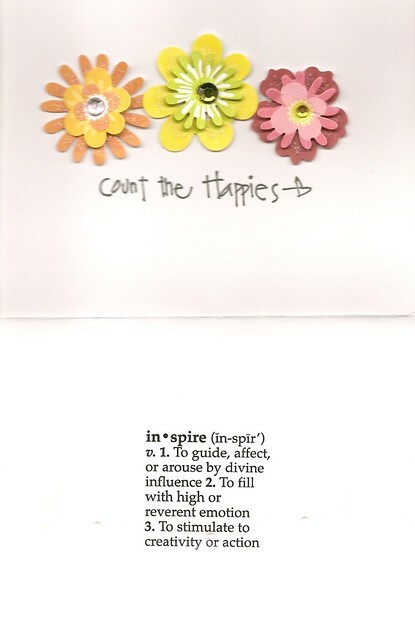 I have it to inspire me. It inspires me to be inspired. 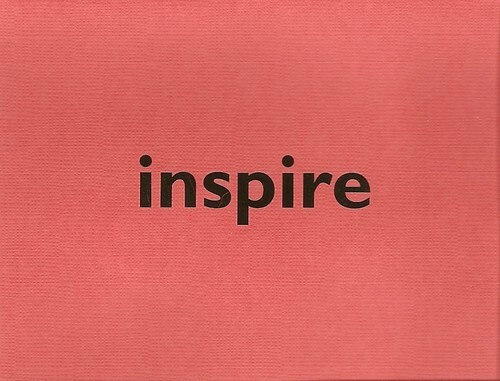 It inspires me to want to inspire people. It sparkles at me, reminding me to count the happies. 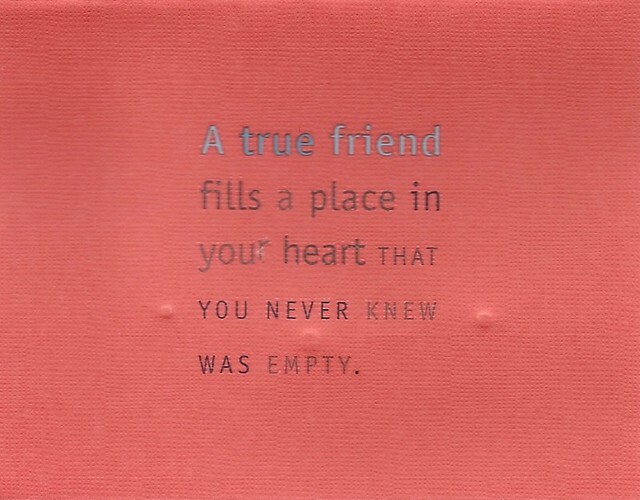 Aroused by divine influence, filled with reverent emotion, stimulated into action all by a true friend that filled a place I didn’t know was empty. We often step on the ball of our foot. We often call it the toe. The Ball of the foot is one of the 52 Moves of Nia. Ballerinas are actually on their toes and they do it in special shoes that have a support in them where their toes are. We usually are stepping onto the BALL of our foot when we step on the “toe”. It is the ball portion of the foot that supports the weight when we are “on our toes”. This is plantar flexion and assists with keeping the ankle joint flexible. If you are standing on the foot you are flexing it can also assist with strength. In a Nia workout class we do all types of movement and sometimes we are using the ball of our foot. We could be stepping or standing. The moment might call for us stepping ONTO the ball either forward, back, or even laterally. Or it could be that we are standing and just rising up. This could be a position where we stay either in a display of balance or it could be a display of agility, a temporary place where we quickly move onto another move. Either way it is all part of how the body was designed to be moved. It might be a nice idea to keep in mind that moving and working the foot in different ways than it is used to being worked might cause some muscle soreness or tenderness through the entire leg. If you are never on your the ball of your feet and suddenly your dancing a few moments on them, your calves might remind you of it later that day or even the next day. Same goes for the whole foot, if you are not in the habit of moving on the whole foot your ENTIRE leg could end up letting you know you worked some leg muscles. As with the whole foot, the ball of the foot can be used in the stances of Nia. Just as I have done with the heel lead and the whole foot, I am going to suggest that you take note of this foot position. As you walk notice when your stride gets to the point of the ball of your foot. As you reach for something on the top shelf and you balance on your toes, notice the flex of your foot and the muscles in your calves. As you walk through your day notice the ball of your foot. I am always a little taken off guard when someone comes to me before Nia class and tells me with shock that they were sore (after the last Nia class). I recently came to the realization that these people who are shocked–and maybe a bit offended–are shocked because they didn’t realize they are exercising in Nia. They didn’t realize what a great workout they received. They certainly weren’t aware that they were using muscles they may not have used in a long time OR that they may not have used in that way. Nia is a vacation from normal exercise, but it IS exercise. Nia is a cardio dance exercise class so there is ample opportunity to move with an intensity that will get your heart rate up. Some people sweat, some people don’t. Everyone does Nia differently. EveryBODY has different needs. Needs can change from class to class. Nia teaches to listen to your body and to learn to give it what it needs. Nia is a form of movement. It is a mixture of nine different movement forms. The mixture includes actual movements from some of these forms and elements and ideas from these forms. But it is not these forms. In other words if you attend a Nia class you will not be practicing yoga, tai chi, or the other martial arts but we might do some moves from some of those forms or we might use the ideas from them. With the availability of so many moves and concepts we are able to move in Nia the way the body was designed to move. We can play in the different planes, moving up and down and work on the ground. Nia allows us to work on flexibility, agility, mobility, strength, and stability. All of this motion and action is sometimes different from what your body might be used to doing. Even though the movements are moves the body was actually designed to do, some of them you might not do in your everyday life, for instance rotating and opening the joints. When you move your body after not moving it at all or move it in a different way than it is accustomed to moving there is a possibility that you will experience soreness or DOMS. It could be that the muscles are sore or it could be that there is awareness of the joints because the tissues or muscles that make up the joints are strengthening. While doing Nia we encourage people to try all the moves and experience them, but to tweak them so that they are comfortable to the body. Since we invite participants to sense Joy during the workout they might walk away not realizing that there could be some soreness after. Nia is also non-impact, but it can be intense so sometimes people are amazed that they sweat. It IS a workout after all. Not everyone likes to sense the soreness that might accompany a good workout. I like it, I appreciate it because I know that it means I did something good for my body. It is ok for a body to be a little sore, it means that it is adapting to change. If the body is sore because it has not moved then it is good to have it adapt to the change of movement. If you are one that does not like to feel the effects of change on your body, then while in a Nia class you can make your movements smaller. If you don’t mind a little change then keep playing in all the levels. Nia allows for which ever path you chose and whatever you chose is up to you, I just wanted to help you understand so you can be aware of what might be happening and make an informed and mindful choice. It is my pleasure to be your travel guide and enable Nia to feel like a vacation. I also have Tips for a Pleasurable Nia Experience and Tips for Moving Nia. Are you ready for a relaxing yet exciting journey?